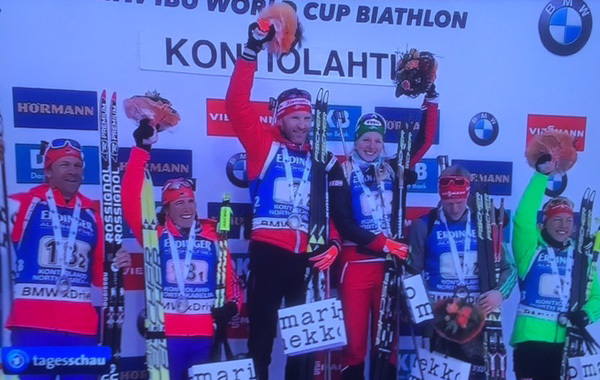 Even this weekend, the second last biathlon World Cup in Kontiolahti, Finland, Susan Dunklee, sponsored by FEUERDESIGN, was extremely successful. After a phenomenal 5th rank in the sprint on Friday she could stand on the pedestal together with her US relay partner, Donovan Bailey. They both achieved the amazing second rank, just behind Austria but ahead of the German team around Laura Dahlmeier and Roman Rees! With this performance Susan showed off a great performance and revealed her top form. Now the journey continues to the season final in Oslo, where the biathlete athletes will perform the last race from this season. We are expecting good results from Susan!